Tech News Flipkart Big Diwali Sale Since November 1, be ready for these offers. 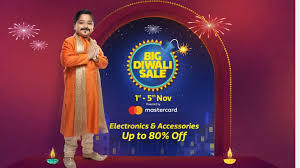 Flipkart Big Diwali Sale Since November 1, be ready for these offers. After the Festive Explosive Days Sale, Flipkart has prepared the next cell. We are talking about the Flipkart Diwali Sale. The sale will start from November 1 and run till 5 November. Many smartphones in this cell will be available in cheap and will be sold with many offers. Now on the Flipkart website, Realme 2 Pro, Redmi Note 5 Pro, Honor 9N and many other handsets have been listed. In addition, sales of Lenovo A5 and Lenovo K9 will start this day. This time Flipkart has partnered with SBI Card for SAIL. Under the Flipkart Sale offer, many mobile and tablet will come with the binary guarantee and complete protection. Flipkart has informed that the new Realme 2 Pro will be made available in the cell at an initial price of Rs 13,990. The Redmi Note 5 Pro handset will be sold for Rs. 12,999. Remember that Xiaomi recently reduced the price of his Shomi Redmi Note 5 Pro for the festive season. In addition, Flipkart has listed the Honor 9N's 3GB RAM / 32GB storage model for Rs 9,999, while its price is Rs 13,999. Apart from this, Nokia 5.1 Plus, which was launched recently for Rs. 10,999, will be sold for Rs. 10,499. Sale of Lenovo A5 and Lenovo K9 in Flipkart Sale will begin for the first time. Remember that Lenovo had recently introduced Lenovo K9 and Lenovo A5 smartphones in the Indian market. Now it is learned that both the smartphones will be sold in Flipkart Big Diwali Sale starting on November 1. Let's say the Lenovo K9 is priced at Rs 8,999 and the Lenovo A5 starts at Rs 5,999. Lenovo's 9 in the cell will be available in Blue and Black color, while in Lenovo A5 Black and Gold color. Apart from this, a 75 percent discount on television and other home appliances will be available on Flipkart. Products can be used with old product exchanges. Apart from this, there will be an option of non-interest EMI. Flipkart has also announced the Avery Deals. Apart from this, many exotic discounts will be available from 12 a.m. to 2 p.m. on November 1.